We often heard about crepe cake, the layered thin pancakes with cream and fruits in between. Finally, a new cafe in town named Cafe De Vie started their business few months ago and their star dessert is CREPE! One of the dessert that I would love to try for a long time. I love the simple concept of the cafe, a very cozy cafe for a long chat too. The cappuccino wasn't sweet at all, which is good and add in sugar according to our preference. As for the crepe cake, I like the soft texture of it, crepe wasn't sweet as well. Some may say their crepes wasn't nice, as what I could comment, something different and currently I have visited twice to the cafe and until I found the next cafe with delicious crepe, maybe by that time, it is suitable for me to comment which one nicer. ;) Frankly speaking, they haven't catch my attention that made me crave their crepes very much, yet. By the way, maybe they could add a bit more on the rum! I didn't taste any rum during my first visit the other day. 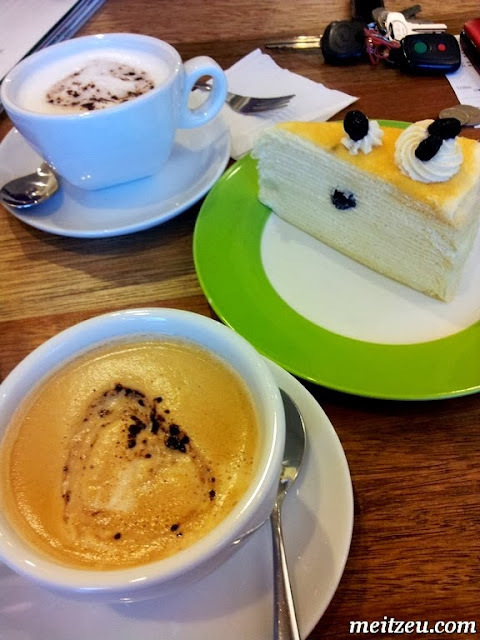 Everyone is crazy over crepe Cake in KL. I must bake them and sell. Wow...kopi and crepe for afternoon break. I love it. I've never really liked crepe. Cuz I always feel that I didn't eat anything even after I ate a crepe. So little. Wakakaa. Maybe I should bring my uncle here. His family likes this kind of place.